Your time is valuable. That is why the Florida Department of Transportation (FDOT) is providing choices and reliability for your daily commute. With the innovative concept of express lanes, you can pay a varying toll when you decide your time is more valuable than sitting in traffic. The choice is yours. All motorists are faced with the same challenges related to traffic congestion, fuel economy and timely travel. Using express lanes will alleviate congestion on roadways and provide predictable travel times in an economically efficient way. 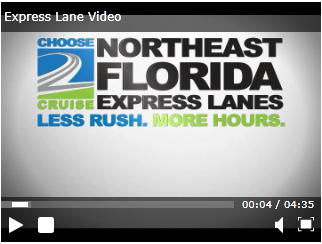 FDOT currently has two projects underway on I-295 and is proposing new express lanes at two locations along I-95.